It was recently reported that two detectives from one of the leading investigative agencies, based in Vishrampur, were spotted in and around the sets of Judwaa 2 wherein; Tapsee Pannu, Jacqueline Fernandez and Varun Dhawan were shooting for their film’s promotions. Sources say that the detectives were called on set to help Tapsee and Jacqueline but we bet you can’t guess what the two gorgeous superstars needed help for! Yes, you guessed it right! 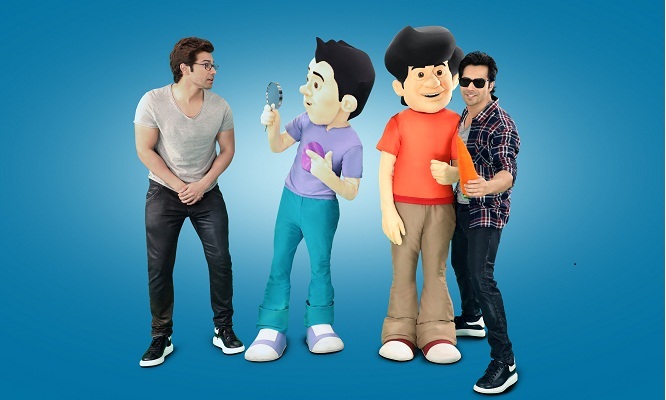 Nick is doing a new campaign with the stars of upcoming film ‘Judwaa 2’ with its hit characters Gattu Battu. Recently they have done a series of campaigns with Bollywood stars for example the last one being Shahrukh Khan dancing with Motu Patlu for the film When Harry Met Sejal. It is a known fact that Varun is playing a double role in the movie and it was very difficult for the leading ladies to spot the difference between Raja and Prem. Although the film is ready for release, Jacqueline and Tapsee still could not distinguish between the twins and hence ended up falling prey to Varun’s pranks! To the rescue were these two detectives who were hired to help the ladies. But who were these two detectives? Well, they were none other than kids’ favourite jasoos jodi from Nick, Gattu Battu! They met Jacqueline and Tapsee and shared some hacks and with the help of their props, the troublesome twin were caught red handed! Following the mystery and mischiefs, Gattu Battu joined the cast of Judwaa 2 and danced till they dropped. The detective duo wished them luck for their movie and entertained everyone with their dose of jasoosi and masti.